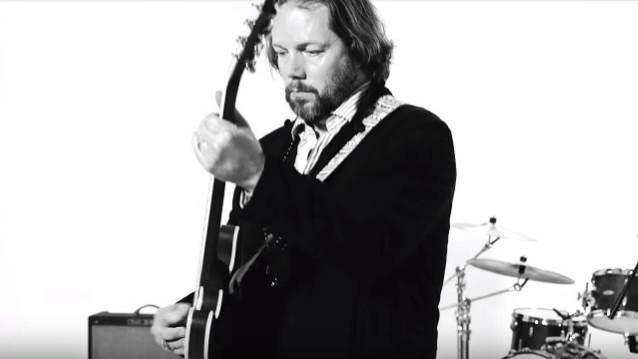 Joe Rock of West Babylon, New York's WBAB radio station recently conducted an interview with former THE BLACK CROWES and current THE MAGPIE SALUTE guitarist Rich Robinson. During the chat, which can be heard at this location, Rich once again said that there is little hope for a reunion of the group he formed with his older brother, singer Chris Robinson. "Being in a band [editor's note: referring to THE MAGPIE SALUTE] that seems a lot more functional now, I wouldn't really ever wanna wish to play in THE CROWES again," he said. "It's too toxic. "It is a shame that it became about money, which it did. Regardless of how Chris wanted to spin it, or whatever it was, or he can go on 'Howard Stern' and say that I'm in a cover band, or whatever he does and says, and then puts together a cover band with musicians that never played on BLACK CROWES records to tour, like he did last year, or this year. Ultimately, he wanted everyone's money. He felt that he was more important and bigger and better than everyone else, and that's delusional and not the case, and I just felt like it wasn't very righteous to live that way. And so the band split up. And now, with getting a few years away from it, I'm pretty happy it did, because I wouldn't have been in this situation that I feel like I can really add to something that is never gonna go down that road. We're vigilant about not letting it go down that road." In an interview with Rolling Stone, Chris Robinson was asked whether he misses his estranged brother. He responded: "All of us have our lives and I wish him all the best and I only want him to be happy, healthy and safe with his family and the people that he loves. Other than that, no." THE MAGPIE SALUTE, which features Rich Robinson and Marc Ford from THE BLACK CROWES, bassist Sven Pipien (also from the CROWES) along with lead singer John Hogg (HOOKAH BROWN, MOKE), drummer Joe Magistro and guitarist Nico Bereciartua, will release its debut album, "High Water I", on August 10. It is the follow-up to last year's "The Magpie Salute (Live)", which was largely recorded in front of a studio audience in Woodstock, New York.